In the first year of my residency training, I was randomly assigned to a House Staff team with several star players, all men. I greatly admired the skills and competence of my colleagues and was delighted to be a part of this team. Once after a long night in an inner city emergency room, dealing with seizures, beatings and one final heart-stopping automobile accident involving three small children, my senior resident turned to me as we were walking, exhausted, towards the elevators that would take us back to the doctor’s quarters. Shamefacedly, he confessed that he had not wanted me on his team but now that I was here he was glad that I had been assigned to him. “Working with you is just like working with a man,” he told me. Although I was careful to appear unmoved by his words, inwardly I was overwhelmed. It was a treasured moment in my professional life. It would be many years before I stopped seeing it as a profound compliment. There was nothing in my training or my professional experience that reflected my wholeness back to me or honored it in any way. And as I had not realized I had lost it, I did nothing to defend it. 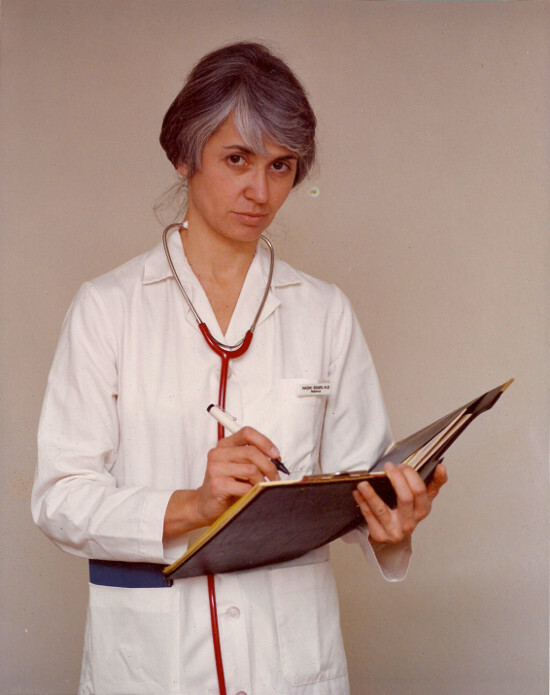 Soon after my training, I received a powerful reinforcement for the person I had become; I was appointed Associate Director of the Pediatric Clinics at Stanford, my first position of real authority within the medical system. I now had an office of my own with my name on the door and a tiny budget to buy a few items of professional furniture. Thrilled, I had gone shopping for a lamp and a desk chair. Stepping into a local furniture store, I immediately noticed a little porcelain statue of an Oriental woman spilling water from a flask onto the ground. The minute I saw it, I knew that I wanted it for my office. But my budget had no leeway for such a thing and I could not spend Stanford’s money on it so I left without it. That night I awoke from a nightmare terrified and feeling as if I was dying. In my dream the porcelain woman had come alive and called out to me, saying “Don’t leave me behind! Don’t leave me behind!” Shaking it off, I went back to sleep…but the next night I dreamed of her again. Again I awoke with a sense of dread and the feeling that I was dying. So even though it meant spending money out of my own slender savings, I went back and bought the statue and brought it to my new office. Because there was no other place to put it, I left it on my desk right next to the phone. It was there for years. Often I would hold it in my hand while I was working through some of the more complex decisions about the clinic and its large staff or returning the calls my patients had made to me. Slowly over time, I started to remember myself. When I left the University to begin what has become my lifework, I took the statue with me. She was the only thing in my office that actually belonged to me. Everything else that had surrounded me for years belonged to Stanford. 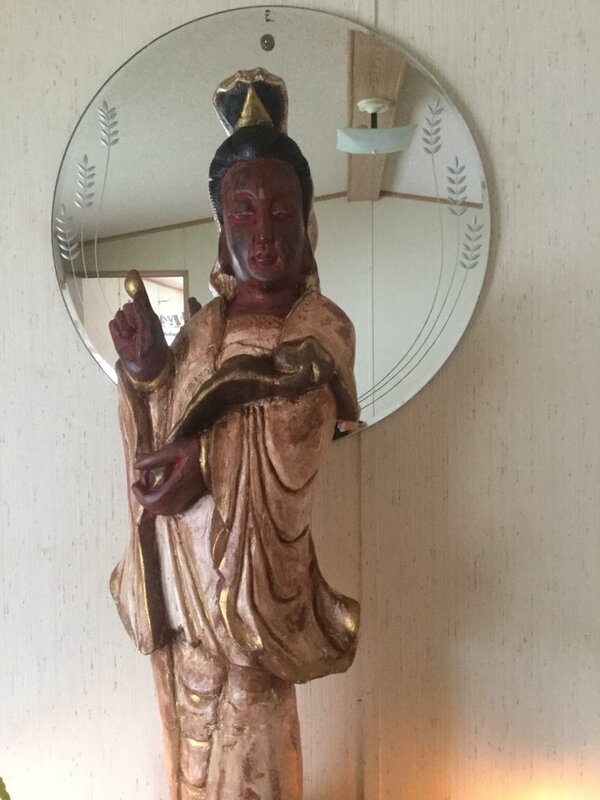 I now know that the little statue is an image of Kwan Yin, the goddess of compassion, sometimes described as the feminine aspect of the Buddha. Despite an intense and very conscious effort to cast myself in another mold, something in me had recognized her instantly and had claimed her for my own. I had held her close to me long before my conscious mind knew who she was and that in a profound way, she represented my healing. Here is a picture of the young woman who bought the Kwan Yin statue for reasons she did not understand. I hold her close to me too and am grateful for the deep wisdom in her that reached out for compassion, despite all. Symbolism is the language of the unconscious mind, the deep wisdom that is part of how we are made. Many things we do without thinking are ways the unconscious reminds us of our larger nature and heals us. It may take many years before we can draw the sword from the stone personally and know who we truly are. Before that time, the unconscious may reach out, without our knowing, to feed parts of ourselves which have been neglected and disowned and strengthen them until we can come back for them. I am so touched by this story. How beautiful that Kwan Yin found you (and pursued you in your dreams!) until you were ready to recover this lost aspect of yourself. Thank you for sharing this! So true. Many times I have been drawn to an object or book (Kitchen Talk Wisdom) and have received many blessings. Thank you for your authenticity and stories. Dear Rachel Greetings! Good wishes for your wellbeing. since first encountring your Self, shared the light of your inspirational wisdom with others. The story about the casually dressed enterotherapist with gentle fingers; not sterile gloved but wearing a smile of kindness; unknown by hospital staff, was superb. This story, like so many others, is a wonderful reminder to appreciate ourselves. After reading this I looked back on several pictures of my self over time and remembered some wonderful things about who I was and who I have become. As always, your open and honest insight from the heart is so golden that it enriches all of us who then spend it to bring to remembrance those things that are truly good. Thank you for all wonderful stories and encouragement. Since you are Crohn’s sufferer, can you,please, advise on the finding the best possible experts in the field of treating this disease? Thank you for all help and any hint in which way to go. I believe who we are is a process not a stagnant thing, who I am today is a very different person then who I was ten years ago. We grow and “morph” each day. The people we meet in our lives also shape that process. In 1984, I sat in a small meeting room with 13 others who had just been accepted into a small graduate program. It was time to meet the faculty. In walked this stunning woman who seemed to shine from within. Her whole aura was that of a healer and I aspired to be just like her. For about two short years, I got to work with her, then our paths went in different directions. That short association greatly influenced the tapestry that is my life as it has again as I read this blog. It’s so nice to reconnect again.